Wolverines 3-5 from three early. 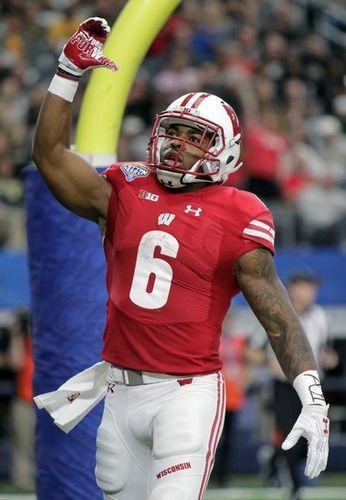 Badgers down 5. Illikanen and Trice in for Wisconsin after the timeout. Iverson is not with the team today due to a death in the family. Timeout Wisconsin. Michigan leads 19-13 and are 8-for-12 from the field, hitting some tough shots. Six straight points for Michigan, which leads 19-13 with 11:08 left. The Wolverines are 8 of 12 from the field. #Badgers ' D, so good vs, IU and Cats, is getting shredded. Michigan is 3-6 from deep/8-12 overall for 19-13 lead. ZAK!! He's got 6 points. MICHIGAN leads, 19-13, with 11:08 to play here in the first half. Wisconsin facing its biggest deficit in the tournament thus far, a paltry six points. Wolverines are hot, 8-for-12 from the floor and 3-for-6 from downtown. Hayes & Koenig 4pts. Michigan with a 6-0 run. Wisconsin calls timeout down six. Badgers shooting 54.5% from the floor, but UM is shooting 66.7% (8-12) early. Trice-Showalter-Hill-Koenig-Brown on the floor after timeout. Wonder if we see Illikainen again. So which team cools first? THREE from Koenig to cut the Wolverine lead to three. #Badgers Happ off to a slow start -- 1-5 shooting. Abdur-Rakhman picks up his 2nd foul at the 8:10 mark. Showy draws the charge! His 7th of the season. Great look by Trice to find Hayes for the dunk. Happ grabs the charge on the other end. #Badgers Happ with second TO. Has 6 boards and two assists but also still 1-5 shooting. Michigan up 24-20 with 6:24 left. Hayes with 8 points to lead the #Badgers . Koenig has 7. Dear CBS - we don't care if you go full "camera view from the top of the key to the baseline" but please use a wide-enough lens. 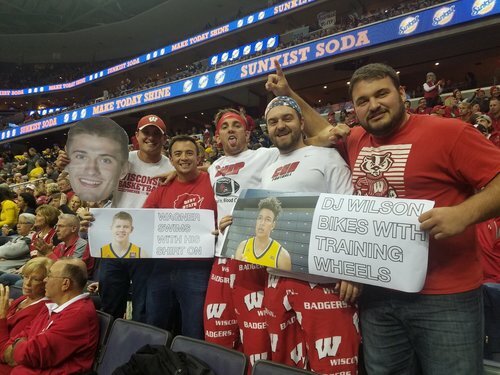 #Badgers allowing 62.5% shooting (10-16) and trail, 24-20, with 6:24 left in half. Timeout on the floor. MICHIGAN leads, 24-20, with 6:24 to play in the first. Nigel Hayes has 8 points and a pair of rebounds, while Bronson Koenig has 7 points for the #Badgers . #Badgers had 6-2 edge in paint points. Now even at 10-10. Thought Michigan might have dead legs on shots with four games in four days. So far that has not been the case. Wolverines 24, #Badgers 20. Wagner looking like a German Dirk Nowitzki for the Wolverines so far. 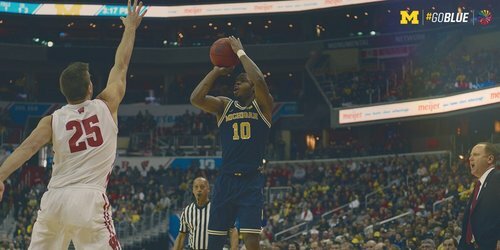 Back-to-back 3s have Walton up to 12 points, and Michigan up 30-20 with 5:22 left until halftime. #Badgers Trice didn't get out onto Walton, who buried another 3. Michigan is 6-10 from 3 and up 30-20. Michigan shooting 66.7% from the floor, including 6-10 from three. Badgers down 10. No signs of tired legs for Michigan. Wolverines 12 of 18 shots and 6 of 10 from 3-point range. Wolverines lead 30-20 lead w/ 5:22 remaining. Derrick Walton Jr. with back-to-back 3s, forcing Wisconsin to call timeout. If Walton ever emerges from his beautiful dream, Wisconsin should be able to close the gap. Has 12 points so far, including 4-5 from three. When the shots are falling.